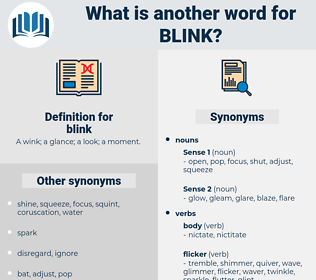 What is another word for blink? 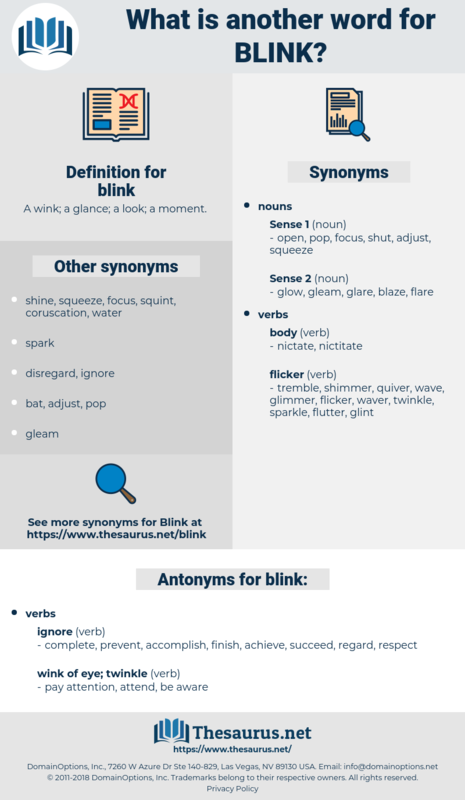 A wink; a glance; a look; a moment. complete, prevent, accomplish, finish, achieve, succeed, regard, respect. pay attention, attend, be aware. dip, confront, browse, contend, peep, fight, scan, thwart, wink, resist, battle, hold off, repel, glimpse, face, defy, glance, meet, combat, peek, withstand, oppose, counter, object. Stires may have managed to blink that fact; but no one else did. I was getting hardened; I could stand a mere impossibility or two and not blink; but this! billowing, Blanc, bay lynx, bluing, bowling shoe, bellying, bawling, blank check, billings, blanch, bellowing, blank, balenciaga, blennius, bolanci, boiling, blueing, Blank Cheque, balance, bahia blanca, befooling, blinks, Bluenose, bluewing, bull neck, bubbling, buffalo wing, by all means, bubbliness, bull nose, balminess, bulnesia, babbling, baffling, belling, balanus, balinese, bowling, blench, blooming, bullnose, blemish, billing, belong, blueness, blink away, blowing gas, bulimic, blowing, bobolink, bullying, ballooning. instinctive reflex, reflex, inborn reflex, physiological reaction, innate reflex, reflex response, unconditioned reflex, reflex action.